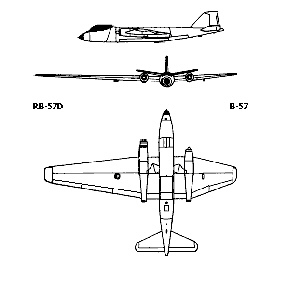 RB-57D: Twenty RB57D models were built by Martin Aircraft sporting a wing now lengthened from the original 64 to 106 feet. The added high lift with two upgraded J-57 10,000 pound thrust engines only required partial throttle and 2000 feet of runway for takeoff. In 15 minutes at a 25 degree climb, the "spy in the sky plane" was at 50,000 feet. 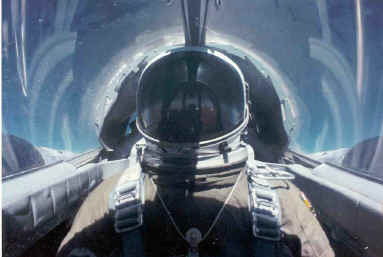 It would continue to a mission altitude up to 67,000 feet out of the range of Russian MIGs. However, the lightweight honeycombed wing was its undoing. After several wing failures in the air and on the ground, the RB57D was relegated to a role as a nuclear weapons detonation air sampler. Later, it was converted to ECM capability and pitted against our high altitude interceptors. 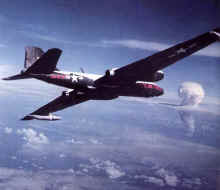 RB-57D with detection pods under the wings sniffs the air near a stateside nuclear test. I was a design draftsman on the Canberra from June 1952 till March 1957, then served two years in the US Army Corp of Engineers, Fort Leonard Wood, Missouri. Most of my work was on the B model, the RB model, the Tow Target model, Ship 76, and the D model. One of my most memorable projects was designing the blanketing of the wheel well cavities on the D model to prevent the tires from freezing at high altitude. I was given the job after another designer's design failed, and became the material wrapped around the landing gear on landing. I worked with a man in the fabric shop, and we came up with a design that involved vinyl covered fiberglass mats that were screwed via screwnuts into the various fittings, bulkheads, and frames in the wheelwell. I also liaised with engine people. Warm air was bled from the engine exhaust into the wheelwells to help keep the temperatures up. It worked splendidly! B57E: In May, 1963, the B-57E became operational in Vietnam as a reconnaissance aircraft under the classified "Patricia Lynn" project. The short-wing returned and for eight years the bulge-nosed camera-packed platform sported the latest in electronic surveillance equipment. Its primary function was to locate North Vietnamese (NVN) and Viet Cong (VC) concentrations and night supply movements in Vietnam, Laos, and Cambodia. In 1970, the U.S. Military Assistance Command Vietnam (MACV) credited "Detachment 1" RB57s at Tan Son Nhut AB with providing more than 94 % of the battlefield intelligence. 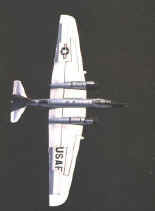 RB57F: Fourteen RB57F models were converted by General Dynamics using the main framework of the B-57E. The wingspan was nearly doubled to 126 feet with the wing area more than double. The J-57 engines were upgraded to Pratt-Whitney (PW) TF33-P11A turbofans. The "all wing and engine" RB57F then strapped on two air-start GE J60-P-9 turbojets. 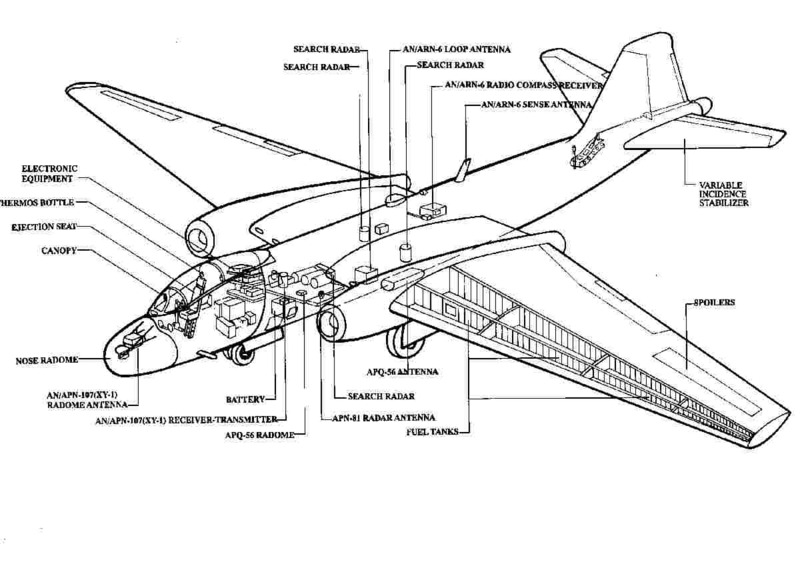 Using a strengthened honeycombed skin on the flight surfaces and doubling the area of the vertical fin, the aircraft hardly resembled its British Canberra predecessor. (Photo: Robert Mikesh) The RB57F was re-designated the WB-57 with the 58th Recon Squadron at Kirkland AFB, NM and served the Atomic Energy Commission (AEC) and NASA as air samplers. Wherever there was suspected or known atmospheric nuclear weapons testing from Germany to Australia to Japan to the South Pacific, there, too, was the WB57F. I was asst crew chief on a RB57F, from 1966 to 1967. Then I went into phase inspection(100Hr), where I tore them apart on a daily basis. We had 3, tail numbers were 501 or 301, changed each mission to complicate picture takers. This was Yokota AB , Fussa Machi Japan. Our mission was Top Secret, is it declassified? 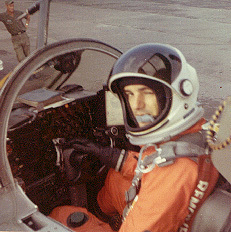 I had the rare opportunity to fly back seat on a four hour local mission, we stayed low,around 70,000, and played hard, the ASTRONAUT who flew was cool. I could tell you stories that you probably wouldn't believe. Our mission was threefold, Air Weather Service, Manned satellite in Orbit, and of course, Nuclear Monitoring of some places that unless declassified, I shouldn't talk about. Strapped in ready to go at Pago Pago. � Copyright Marquis G. Witt, 1998,1999, 2000, 2001,2002,2003,2004, 2005,2006,2007,2008: Materials may be freely copied and distributed subject to the inclusion of the copyright notice and the web site address. The site is intended for historical and informational purposes. This site contains links to other Internet sites. These links are not endorsements of any products or services in such sites, and no information in such sites has been endorsed or approved by this site.